Transdiaphragmatic pressure can be measured in ICU patients for research or diagnostic purposes when diaphragmatic dysfunction is suspected. It requires simultaneous recordings of Pes and Pga; Pdi is obtained by measuring the differential pressure between these two signals. Because Pga usually rises, or is positive, during inspiration whereas the Pes signal is usually negative, subtraction of Pes from Pga is, in effect, the sum of the two tidal excursions. This measurement is described in more detail elsewhere. The potential applications of this measurement in ICU patients are summarized in subsequent text (see Techniques for Pressure Measurements in Section 2 of this Statement). Absolute values of the Pdi swings. Although this measurement has not been used for quantification of respiratory muscle dysfunction, its relation to the amplitude of Vt is a reflection of the degree of mechanical coupling between the respiratory muscles and the respiratory system. While a normal subject may require a Pdi swing of 5 cm H2O to obtain a Vt of 500 ml, a severely diseased patient, as often seen in the ICU, may develop up to 30 cm H2O to achieve only half of this volume (85). The same reasoning can be used for Pes swings. Minimizing tidal Pdi has also been proposed to be a target for titration of pressure support ventilation (139). Figure 5. Loops of esophageal pressure against Vt used for computation of the work of breathing in a patient successively ventilated with pressure support (PS) of 0, 10, 15, and 20 cm H2O. 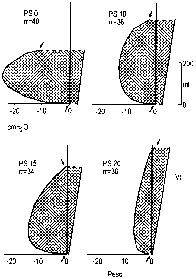 The work per breath is represented by the cross-hatched area subtended by the inspiratory part of the pressure-volume loop on the left and the relaxation curve of the chest wall on the right. Arrows indicate the beginning and end of inspiration. The relaxation curve of the chest wall is passed through the elastic recoil pressure of the chest at end exhalation, and the distance between the beginning of the pressure-volume loop (arrow) and the relaxation curve represents intrinsic PEEP. The concomitant decrease in the work per breath and in the respiratory rate (rr) results in a large reduction in the work of breathing per minute (power). Reprinted by permission from Reference 55.
problem exists for the diaphragmatic tension time index (Pdi/ Pdi,max X inspiratory time [ti]/total time of the respiratory cycle [ttot]), which incorporates the duty cycle (142). Also, calculation of mean Pdi and ti/ttot is complicated by the difficulty in determining the baseline value of Pdi in such patients (84) (see Maximal Static Inspiratory and Expiratory Pressures in Section 2 of this Statement). The absolute values of Pdi,max can be used to estimate the strength of the diaphragm, but normal values have a wide range: varying between 60 and 240 cm H2O. The Pdi value obtained during a sniff maneuver constitutes an attractive alternative because it is much simpler to perform. However, its reliability in intubated patients has not been rigorously tested. The ratio of the inspiratory Pga swings to Pdi. The Pga/Pdi ratio has been proposed as a means of assessing the diaphragmatic contribution to the tidal effort (143). The higher this ratio, the greater is the diaphragmatic contribution to the tidal breathing and the smaller the contribution of other inspiratory muscles, which all contribute to the negative intrathoracic pressure swings. in icu patients, this contribution is often small (frequently < 20%), indicating that recruitment of accessory muscles is a common occurrence (141-144). A precise quantification based on this index is made problematic by the fact that Pga is influenced by abdominal compliance, which can vary with abdominal muscle tone, position, and other factors related to abdominal contents. it is a crude yet useful index, nevertheless, for the detection of diaphragmatic dysfunction or paralysis, especially in the postoperative period (144-148). A negative Pga/Pdi ratio indicates severe diaphragmatic (or phrenic nerve) dysfunction and represents the equivalent of a paradoxical abdominal motion. correct interpretation of this measurement requires careful avoidance of two pitfalls. First, the incorrect placement of the gastric balloon in the lower esophagus mimics exactly severe diaphragmatic dysfunction; this problem is not trivial, because the main criterion for checking the correct placement of the gastric balloon is often the shape of the signal (144). Second, recruitment of abdominal muscles during expiration is followed by a sudden relaxation at the beginning of the next inspiratory effort, which can also mimic diaphragmatic dysfunction (94, 95, 123, 149). Because this is a frequent occurrence in icu patients, special attention should be paid to this problem (and ideally an abdominal wall relaxation curve should be obtained). Examination of the Pga signal during expiration. This allows detection of phasic expiratory muscle activity, and it may help in the differentiation of dynamic hyperinflation from expiratory muscle recruitment as the mechanism that explains the presence of a phase lag between the beginning of the negative Pes swings and the onset of inspiratory flow, which is often referred to as "intrinsic PEEP" (94, 95, 123, 149). Ideally, measurement of pressures should be coupled with an estimate of thoracic and abdominal dimensions to correctly interpret the changes in pressure. Maximum relaxation rate. The rate at which Pdi returns to baseline with each spontaneous breath, or after stimulation or after a sniff maneuver, can be used as a predictor of diaphragmatic fatigue (150, 151). Maximum relaxation rate has been used in the icu to study patients being weaned from mechanical ventilation (152). Weaning failure was associated with a slowing of the maximum relaxation rate of the respiratory muscles (Pes) and of the diaphragm, indirectly suggesting that the applied load in these patients exceeded the capacity of the respiratory muscles (see Relaxation Rate in Section 5 of this Statement). Figure 6. 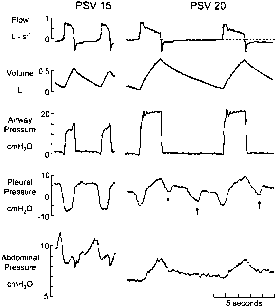 Recordings illustrating the method used to assess patientventilator interaction. From top to bottom: flow; volume; airway pressure; pleural pressure (Ppl); and abdominal (gastric) pressure. Ineffective inspiratory efforts are revealed by negative swings in Ppl during expiration (arrows) that are not matched with a ventilator-assisted breath. The concomitant declines in Ppl and abdominal pressure at the beginning of expiration suggest that Ppl was not dominated by abdominal muscle contraction. PSV 15 and PSV 20 indicate pressure support ventilation of 15 and 20 cm H2O, respectively. Reprinted by permission from Reference 106.
impractical in critically ill patients (153). Measurement of the response to a single supramaximal stimulation of the phrenic nerve, i.e., twitch stimulation, is an appealing method of monitoring changes in diaphragmatic contractility (153). This approach has the considerable attraction of being independent of volitional influences (154). However, systematic investigations of twitch stimulation of the phrenic nerves in critically ill patients have yet to be published. The recent introduction of magnetic stimulation (155-157), which has several advantages over electrical stimulation of the phrenic nerves, should further increase the feasibility of twitch stimulation in the ICU setting (see Phrenic Nerve Stimulation in Section 2 of this statement).